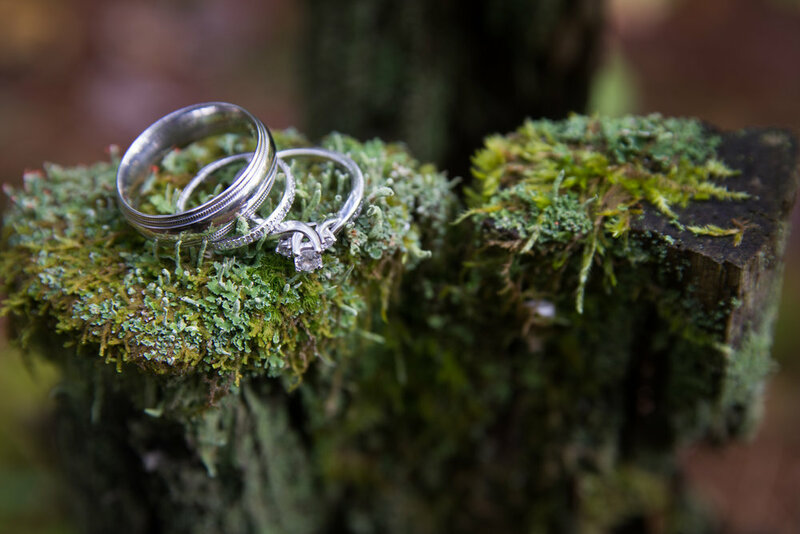 The day began with cloudy skies and slivers of sunshine peeking through as we headed over to cabin 1 where we would begin detail shots- one of our favorite parts of the day! We gathered together Katelynn’s shoes, the rings, and of course her dress! 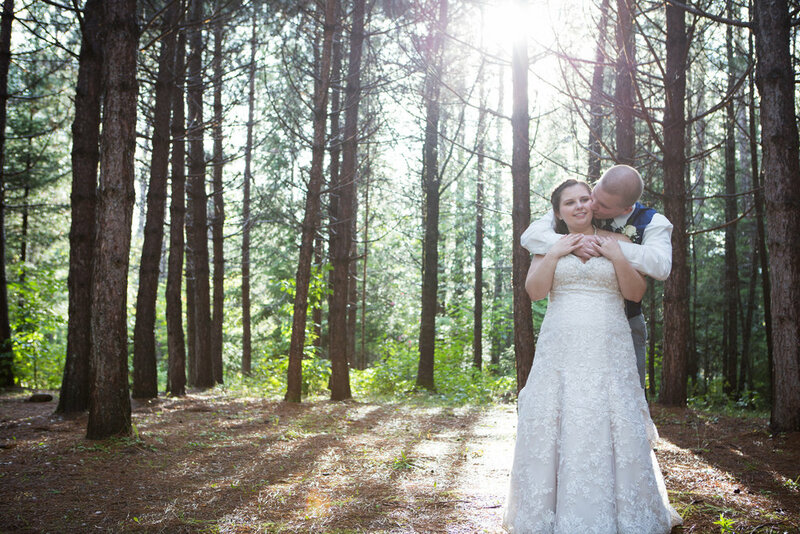 We found the most majestic spot behind the bride’s cabin where there was abundance of beautiful, ethereal trees. Tall pines surrounded areas of moss and small spots of sun highlighted the lush greenery. There were so many places for rings to be put and shoes to be placed. 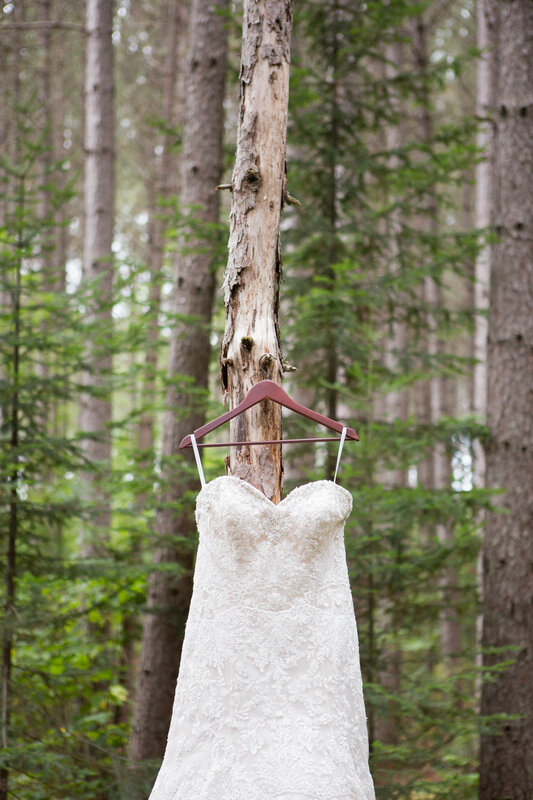 We hung the dress from one of the tree branches and captured it in this superb location. The bride and her bridesmaid's returned from getting their hair done! 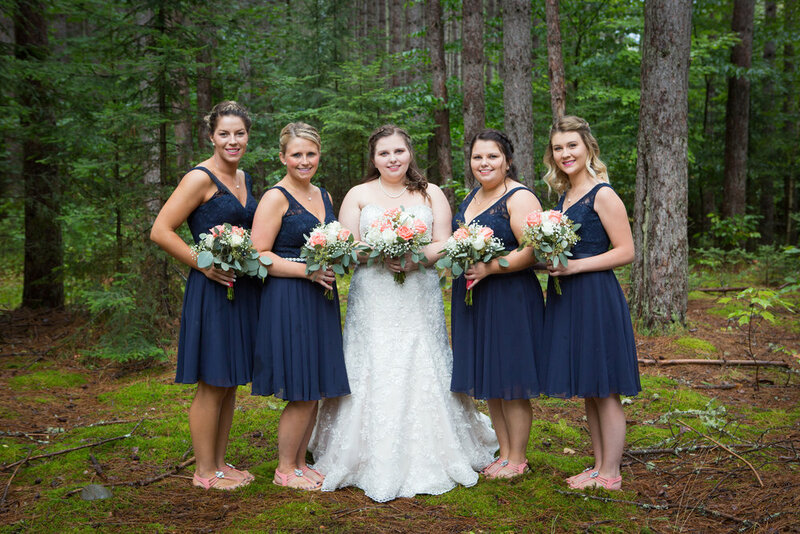 They slipped into their bridal robes for a more comfortable (and matching) look! The colors were pink, sporting their names on the front and their title on the back, except for Katelynn whose robe was white. Madison, one of the bridesmaids, did Katelynn’s make-up. They sat by one of the windows watching the soft rain fall, utilizing the natural light coming through. Madison told her that, in India, rain on your wedding day is good because “it washes all the bad away and brings in the good.” This made Katelynn smile. Once their make-up was applied; it was time to dress up! All the girls got into their dresses - a deep navy blue with lace. Finally all the attention was on Katelynn as her mom Michelle and sisters Ashlee and Kaycee assisted her in dressing. She was so timeless and gracious in her gown. With her dress on, it was time for the small details. Isaiah had gifted her diamond earrings earlier in the week (a wedding surprise that he couldn’t wait to share). 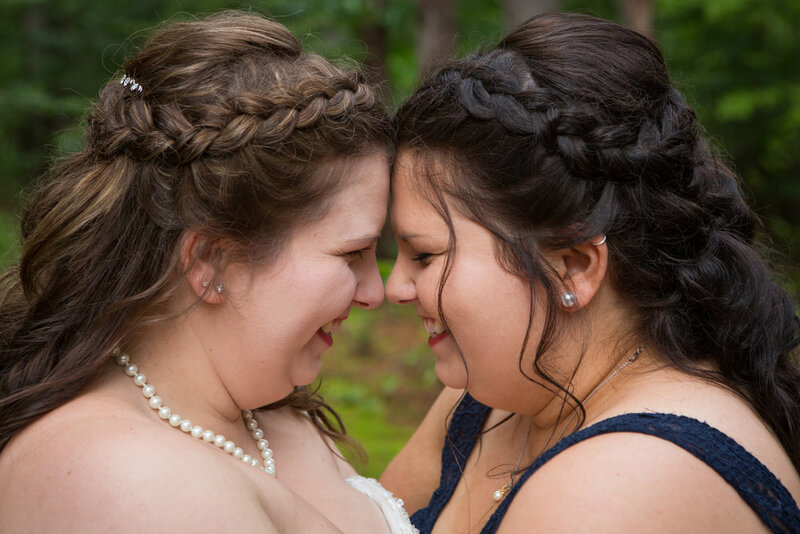 Katelynn’s sister, Ashlee, put the earrings on with a sweet smile to her younger sister. With happy tears and a tender look, her mom hooked her pearl necklace around her neck and she quickly kissed her cheek before wiping her eyes. 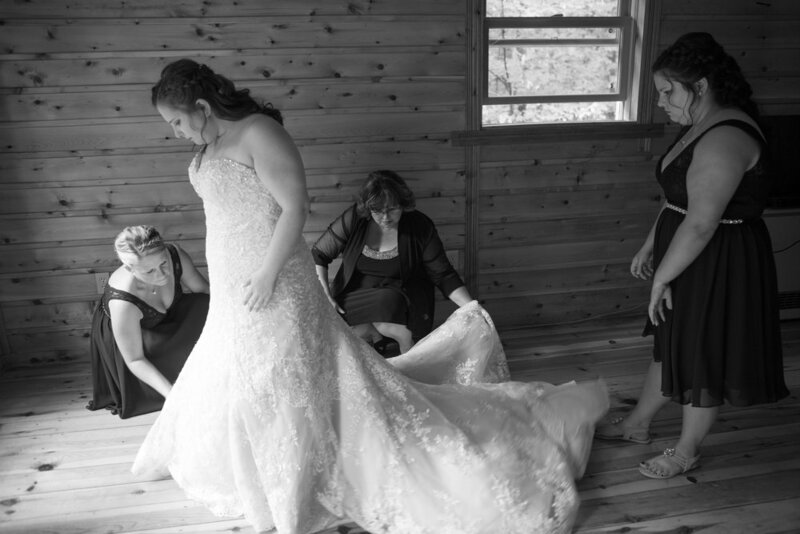 Kaycee, with Katelynn’s white heels, dropped to the floor to help her sister slip into her shoes. The clouds opened up in between thunder and a rain shower so we took the opportunity to take Katelynn and her girls out into the woods! We grabbed a few umbrellas -just in case! Thankfully Robyn is always prepared and had packed a red plaid umbrella that meshed so well with the trees in the woods. We were in love with the subtle rain drops falling in the background. The girls posed with each other among the trees. Every time there was thunder, Ashley would always make up a silly reason for the sound, “it was a semi truck passing by!” or “I dropped a pan!” We could not have wished for a better location to photograph Katelynn and her girls! Next, we headed over to cabin 2A where the guys were enjoying their morning together! As they spent time getting ready the storm grew and the lights began to flicker before turning off. There were a few sighs and chuckles as they finished their preparations using the light from the rain filled sky. Isaiah handed out his gifts to his groomsmen, which included engraved pocket knives. We brought the boys out into the woods for their formal photos- keeping a similair look we shot with the girls. 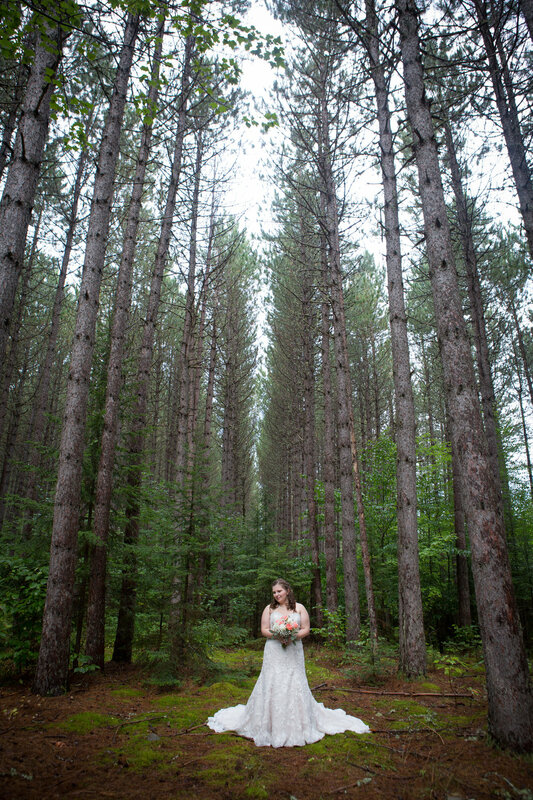 We adored the cloudy skies and the subtle light given through the tall pines. Isaiah had a very calm way to him-knowing he was marrying the love of his life and the day would be perfect for them. With loving smiles they began their sand ceremony. They poured pink and navy sand into their engraved glass box. The colors mixing and becoming one piece of art for the couple to cherish forever. 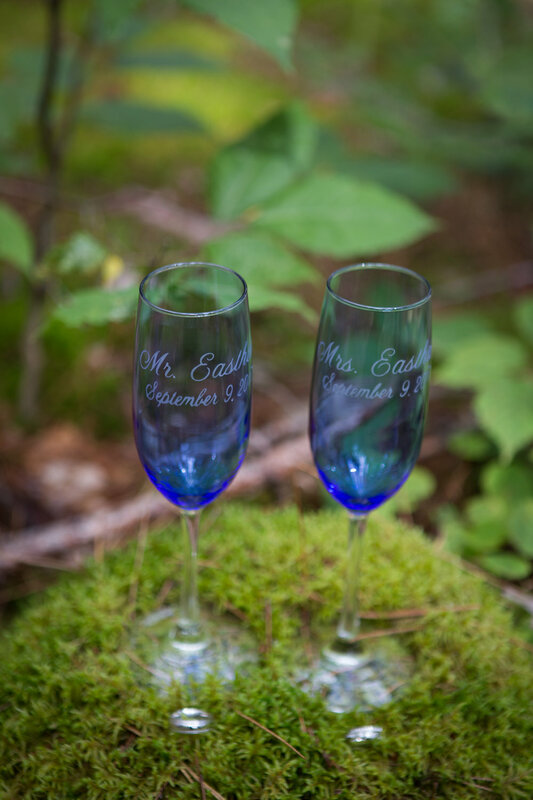 With cheers from their wedding party, family and guests, Mr. and Mrs. Eastham were introduced! 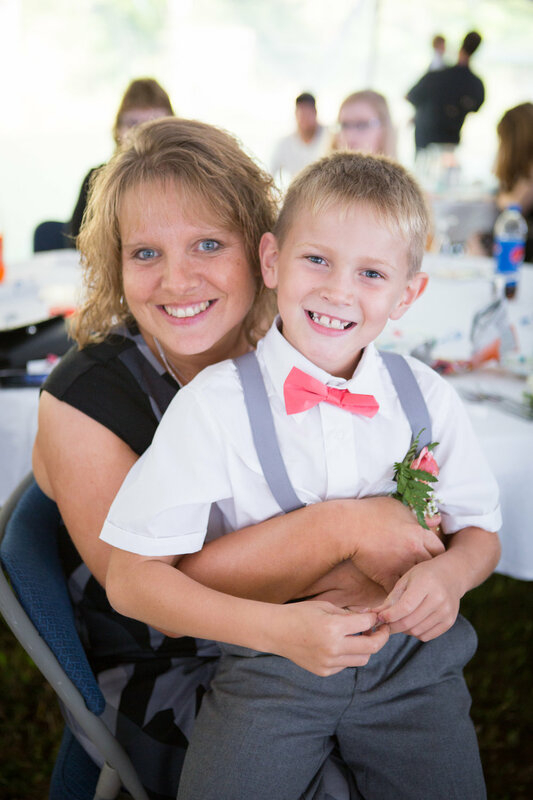 The reception tent was complete with all the little details and ideas from the Bride & Groom. The area was lit with string lights and the tables were round decorated beautifully for guests. There was a table filled with a variety of different favors such as seed packets with stickers that read, “plant these flowers, watch them bloom, just like the love of the bride and groom!” Everything was so simple, but elegant and well placed. Katelynn did a great job planning everything. 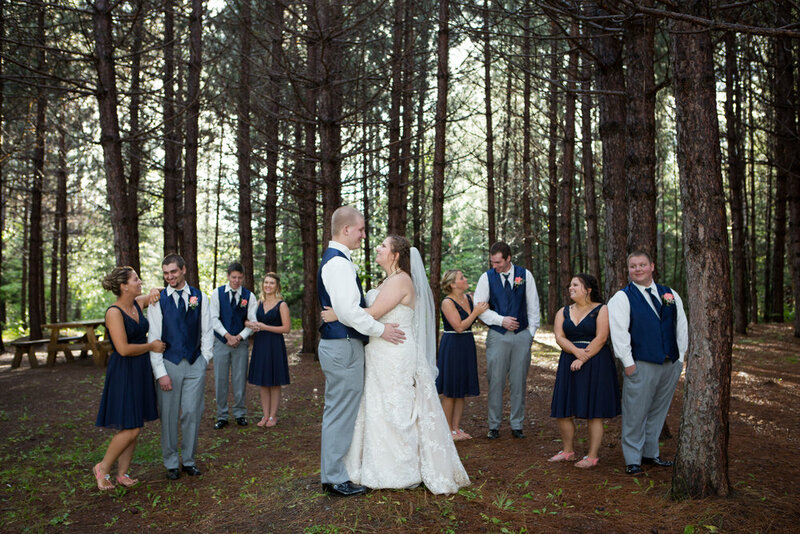 We whisked the Bride and Groom away into the woods opposite the tent for more photos! The light was coming through the trees in such a magnificent manner it would have been a shame to miss it. Katelynn and Isaiah were so easy to photograph-so natural and comfortable in each other's arms. They couldn’t take their eyes off one another and spent so much of their time glowing with love. 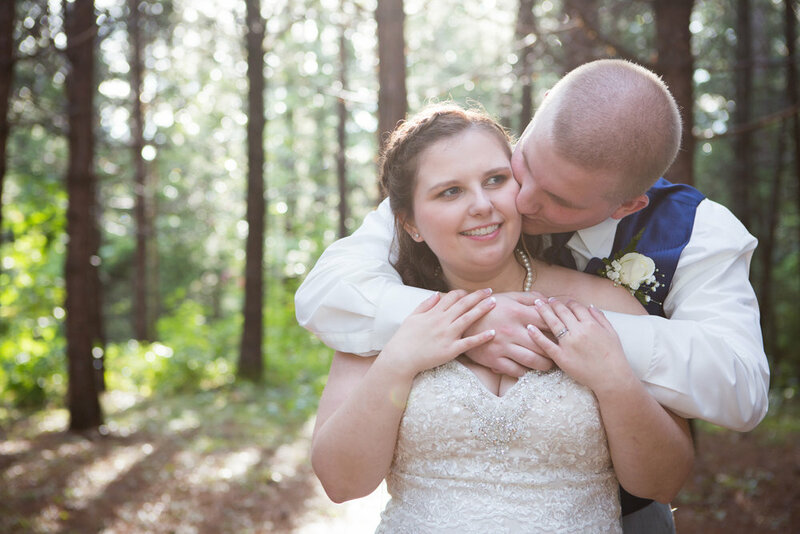 We could tell how much they adored each other and that made photographing them easy! We had them dancing in the middle of the forest, posing in between tree lines, jumping over puddles, and avoiding muddy spots! We loved their formal photos- all time spent with these two was great. Thank you Katelynn & Isaiah for inspiring us with your love & connection. 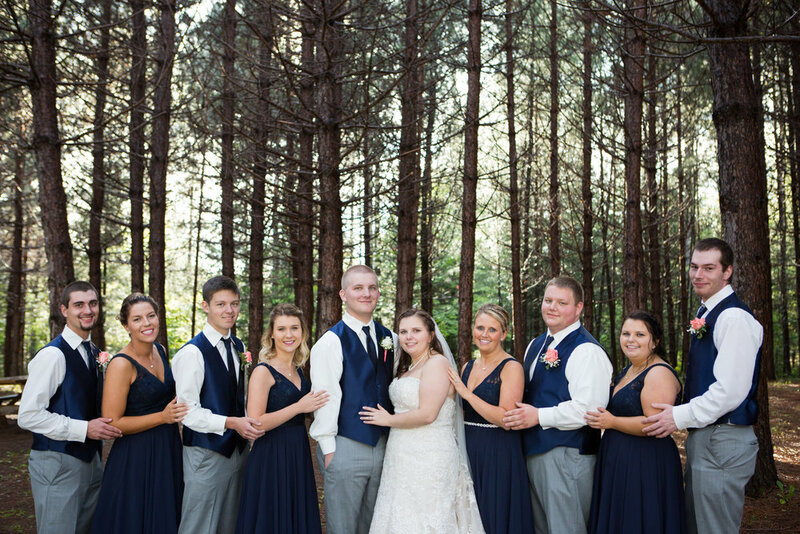 The Wedding Party and the new Mr. and Mrs. Eastham were announced into their reception! They headed right into their first dance- not taking their eyes off each other. 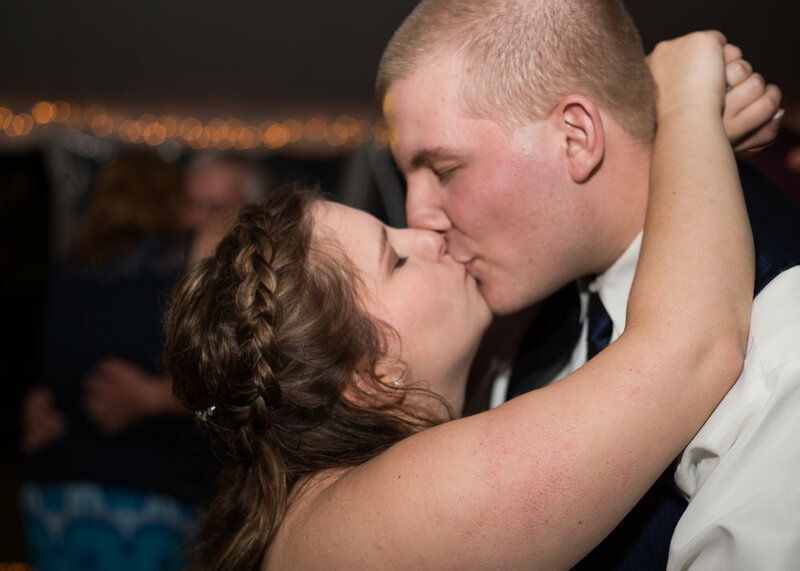 While they danced, their wedding party blew bubbles at them from the sides of the dance floor! 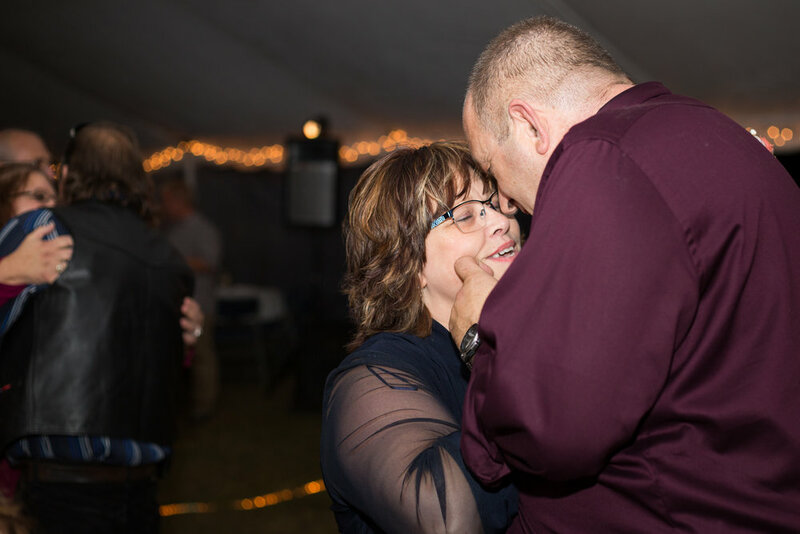 They were in newlywed bliss and soaking up their moment together on the dance floor. After everyone had finished their dinner, it was time for toasts. Ashlee was up first -a privilege of being the oldest. She spoke fondly of her younger sister, while also mentioning she had the best stories to share. 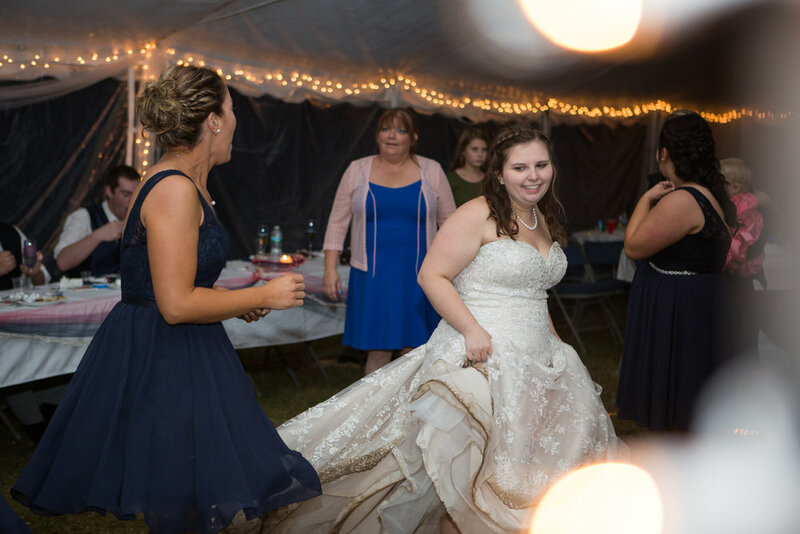 She expressed how proud she was of Katelynn for coordinating such a beautiful wedding. She told Isaiah that she was proud to call him her brother. Kaycee was next, she shared that she found Katelynn to be her role model and that she had grown by learning from her. She told Isaiah, that he was a lucky man and happy and proud to call him her brother. She had everyone toast to “love, laughter and happy ever after.” Ricky was the last to give his speech. He had people laughing about how he was making his speech like a mini skirt - short enough to keep your attention. He told everyone that he and Isaiah had been best friends since sixth grade and were inseparable. He felt that it was an honor to stand next to Isaiah on his wedding day. He told Katelynn that she had brought so much happiness to Isaiah. All the guests and members of the wedding party raised their glasses to the newlyweds! 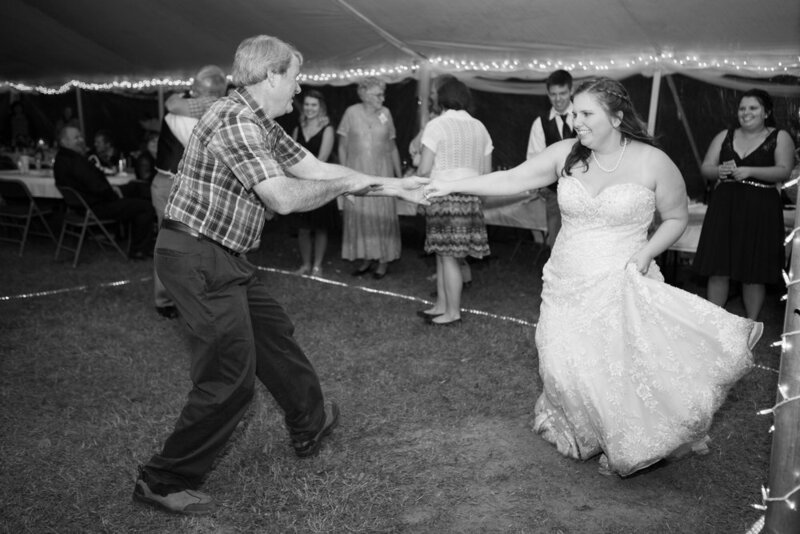 The couple and their guests hit the dance floor to do the Electric Slide, the Cha-Cha and the Cotton Eyed Joe! Everyone was having a blast as they danced to country song after country song! Everyone was really enjoying themselves! Thank you for including us in your special day! We had a blast traveling up to Monticello, getting lost on railroad beds, jumping in rain puddles and capturing you two among the tall pines. You have something so special and we were lucky to witness it! Congrats on your wedding AND your baby news! We wish you two the absolute best in your future together!